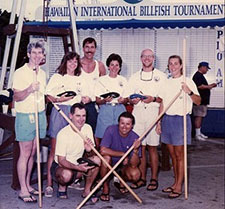 As the 59th annual Hawaiian International Billfish Tournament (HIBT) draws to a close and focuses on its historic 60th anniversary next year, the IGFA would like to take a look at the individual behind the HIBT. Inspired by the Masters Golf Tournament in Augusta, Peter Fithian founded the HIBT in 1959 to draw people from all over the world to experience the big fish of Kona. 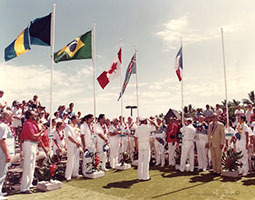 Fast-forward 59 years later, Fithian is still running the event, which has now earned the title of being one of the longest running tournaments in the world. Over the years, the HIBT has not only been used as a model for many of today’s most successful tournaments, but it has also been the birthplace of many innovations in the field of angling and game fish conservation. Most prominently, the HIBT was the birthplace of the original Great Marlin Race, which was established in 2009 during the tournament’s 50th anniversary. 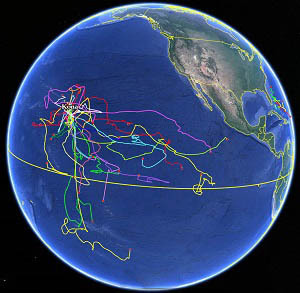 Since its establishment, many amazing IGMR tracks have resulted from the annual event that have provided invaluable data to help better understand the migratory patterns of these great animals. 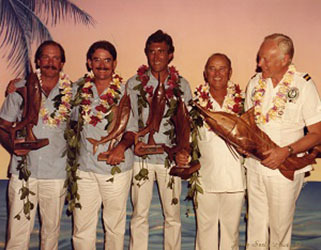 In addition to running the HIBT for nearly six decades, Fithian also founded the Pacific Ocean Research Foundation (PORF) in 1975 to learn more about Pacific blue marlin, and he was instrumental in the foundation of the Japan Game Fish Association (JGFA) - longstanding partners of the IGFA. Fithian also served on the IGFA's Board of Trustees and currently remains as a Trustee Emeritus. In 2017, the IGFA inducted Peter Fithian into the Fishing Hall of Fame for the extraordinary contributions he has made to competitive angling and game fish conservation. Please click the image below to view Fithian's Fishing Hall of Fame induction video.